Profile: Love compassion, mercy are words that have no meaning for Megatron. He has risen to the leadership of the Deceptions by a combination of brute strength, military cunning, ruthlessness, and terror. On Cybertron he was commanding general in charge of all military operations against the Autobots, who referred to him as "The Slag Maker." It was a title of fear, a title of respect, a title Megatron relished. His banishment to Earth has only made him more bitter and more evil minded, if that's possible. He aches to return to Cybertron and complete his mission of eradicating the Autobots. But while on Earth he is dedicated to eliminating those Autobots marooned here with him and his plans go far beyond that. He realizes the Earth is a huge stockpile of metal and Energon resources and means to possess it all, with the aid of his fellow Deceptions. But his plans go even further, plans so grandiose even his fellow Deceptions are unaware: Megatron intends to enslave the entire human race, control Cybertron and be the uncontested ruler of the universe. 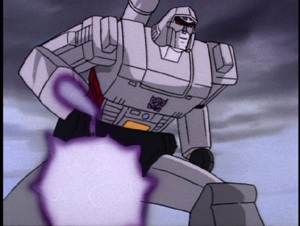 Abilities: Megatron is incredibly powerful & intelligent, the equal of Autobot Leader Optimus Prime. His fusion cannon can convert any small amount of matter into large quantities of explosive nuclear energy. The cannon can fire a blast up to 12 miles & release enough energy to flatten a small town. He can use his circuitry to connect the cannon interdimensionally with a black hole, where it can draw on anti-matter as its power source. The blast from this is greater, but it creates a tremendous strain to do this for even one blast. 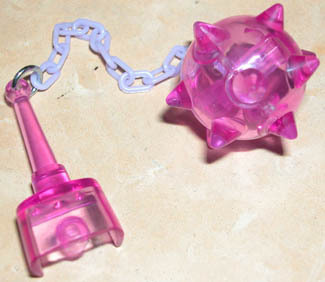 Takara's Japan-only Megatron re-issue, the figure comes with an Energon ball-and-chain as seen in the 2nd episode, MTMTE, in his battle w/ O.P.